The whole point of Tumblr is to allow users to share anything they want online. It provides a hosting solution for your photos, animated GIFs, videos, documents, and more. Anyone can signup for Tumblr to construct their own little blog about anything. After that, people can comment on your posts, share them or simply tell you that they like the posts. Overall, it’s a streamlined version of a regular WordPress blog, focusing on simplicity and modern interfaces. The majority of people who go on Tumblr are pretty young, making it a hub for all sorts of content. For example, you can find plenty of posts that are not suitable for work, but at the same time Tumblr supports interesting music tracks, tutorial videos, and fun things to do with your family. You do have the opportunity to make your own Tumblr blog, but some people are more interested in constructing their own site based on the Tumblr design. The Tumblr themes we’re outlining below aren’t going to look exactly like Tumblr. However, with a little razzle-dazzle you can achieve that sleek look. But I’m not sure you’d get many followers by copying one of the most popular sites in the world. That said, you should seek out themes with support for all types of media, such as audio, images, and video. In addition, you want a feed that showcases the most recent posts in a clear and concise format. Who Needs a Tumblr Theme? Bloggers tend to opt for Tumblr style themes because of their simplicity and built-in media support tools. In addition, these themes are prepped and ready for comments and other user interactions like social shares and likes. Some entrepreneurs might be looking to create a form of Tumblr, maybe with a focus on a certain niche. I’m not sure I would recommend it for a retailer, unless you’re using it primarily as a blog. 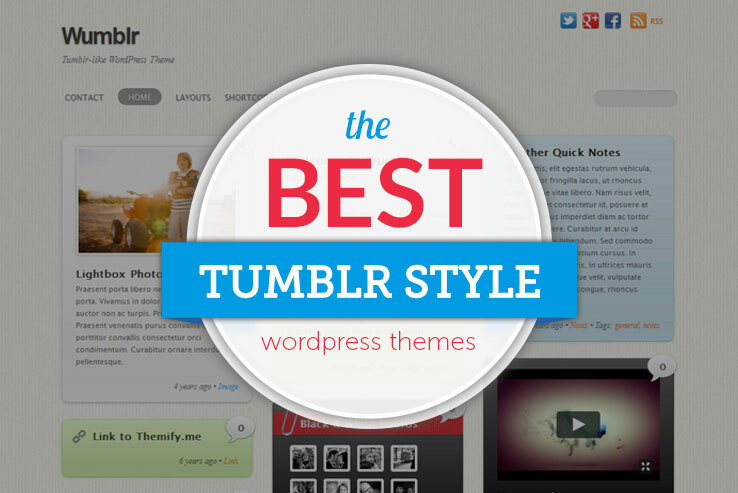 The Tumblr style theme is a popular one among bloggers, photographers and people who just like sharing fun stuff online. That’s why there are so many themes to choose from. If you notice a Tumblr theme that isn’t on this list, feel free to share it in the comments section. 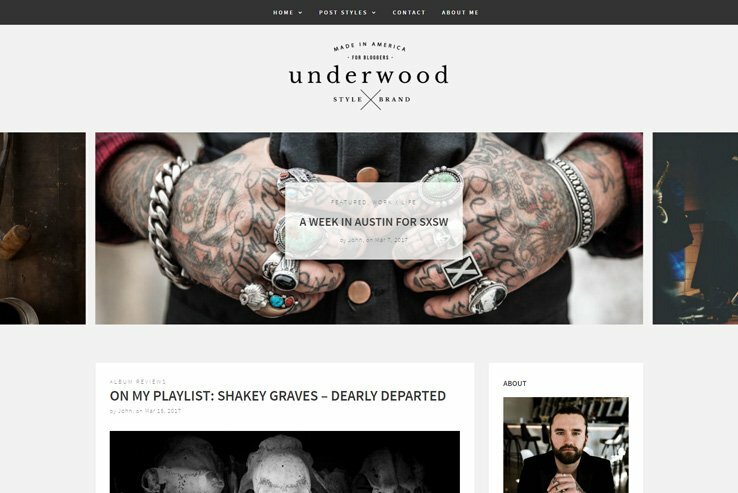 The Underwood theme has a modern look and feel, with a large logo at the top and a beautiful slider right below. The front page includes your blog feed, neatly arranged with large featured banners, a small description and social icons. The theme supports all media types and comes with different page styles that allow easy addition of audios, videos, and images. Additionally, this theme comes with a featured content slideshow, hundreds of Google fonts and unlimited color options for branding purposes. It also supports many popular plugins such as WooCommerce, Yoast SEO, Contact Form 7, and W3 Total Cache, allowing you to easily extend your blog’s features and functionalities. 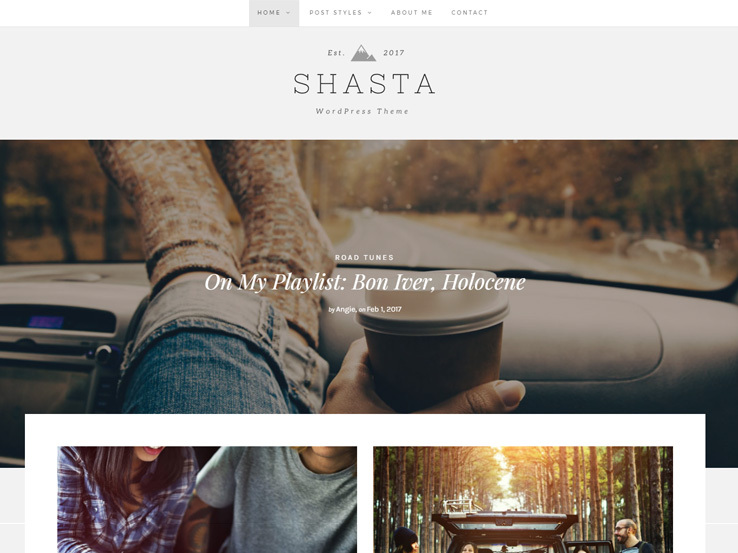 Shasta is a wonderful handcrafted WordPress theme designed with lifestyle and personal bloggers in mind. It features a photo-friendly design and supports all media types including video and audio. 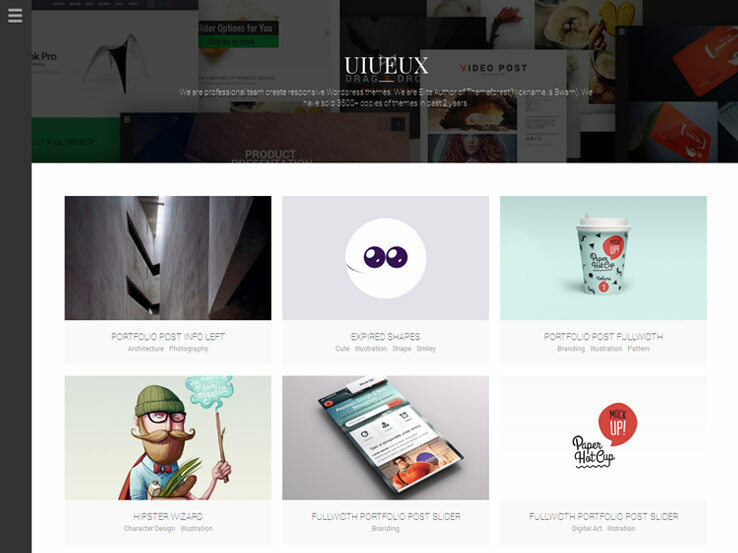 It ships with several homepage layouts including a standard layout that resembles Tumblr. The front page allows you to display your blog feed complete with large featured banners and social icons for easy sharing. Besides, the theme comes with customizable banners that support parallax backgrounds and audio and video players, unlimited typography and color options for branding, and custom widgets that allow you to drag and drop items like your “About me” information, latest content, and social icons to the sidebar or footer. Notebook comes from the developers at Elegant Themes, which is suitable considering the majority of Tumblr-style themes are rather elegant. This theme takes advantage of beautiful post formats and media support. Therefore, you can change around fonts and colors, while also uploading items like videos and images. The advanced CSS3 animations are useful for grabbing attention from users, while the blog posts support comments. The theme comes with complete localization, and you gain access to multiple color combinations and font customizations. We like the fact that all audio files are played through an HTML5 audio player, and the videos you add to the site can come from places like YouTube. Quite a few shortcodes are included with the theme. Therefore, adding a button or column only takes a minute. 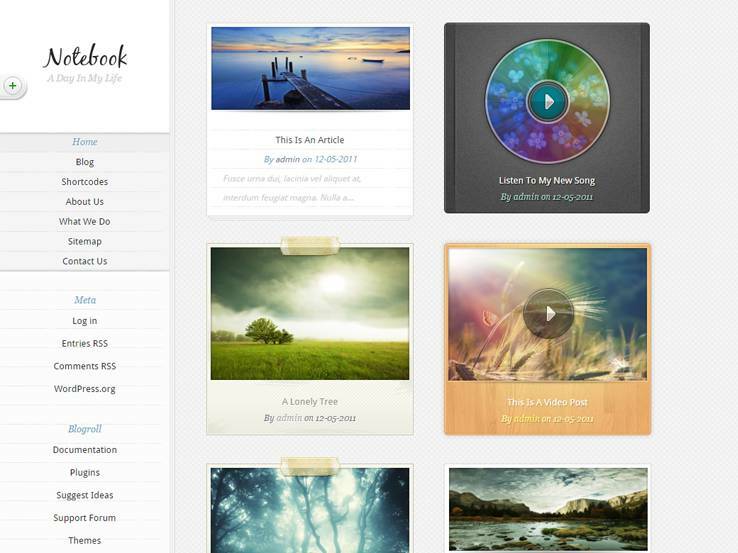 Along with beautiful page templates and theme options, the Notebook theme impresses quite a bit. 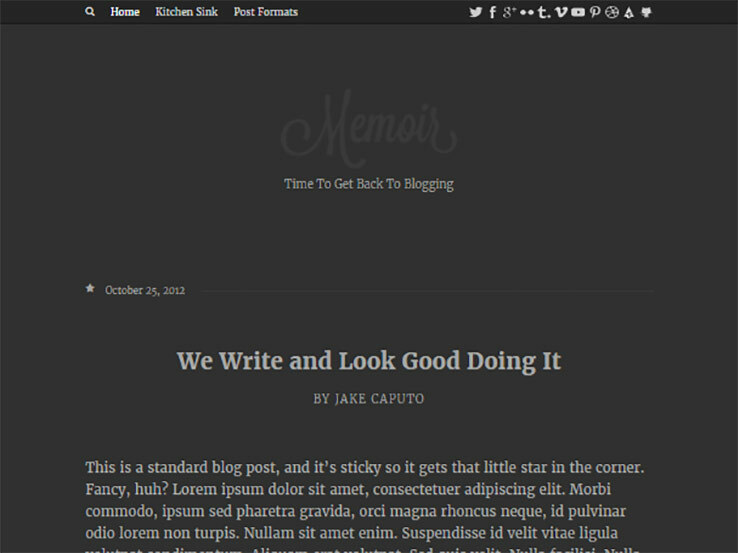 The Troy theme, from CSSIgniter, is somewhat of a re-imagined blogging theme, allowing for a fun, feminine look. The fully responsive theme has a truly unique design and wonderful post formats. You can upload certain widgets for things like social media and Flickr galleries. The widgets are essential if you’d like to support various media types like you would on Tumblr. The theme also has translation files for connecting with people from all over the world. One Troy feature that stands out quite a bit is the fact that it can integrate with just about any page builder on the market. For example, it combines nicely with Page Builder, SiteOrigin, and the Divi Builder. This is a huge advantage, because the whole point of a Tumblr style theme is to avoid non-essential development tasks. Therefore, you can design your website without any hiccups and get to creating content the way you’re meant to. Memoir has Tumblr written all over it. The theme supports the simplest of designs, with a darker background by default and a simple blog feed that rolls onto the next few articles as the customer scrolls down. We like this for writers of all shapes and sizes, since it almost looks like a book with pages. 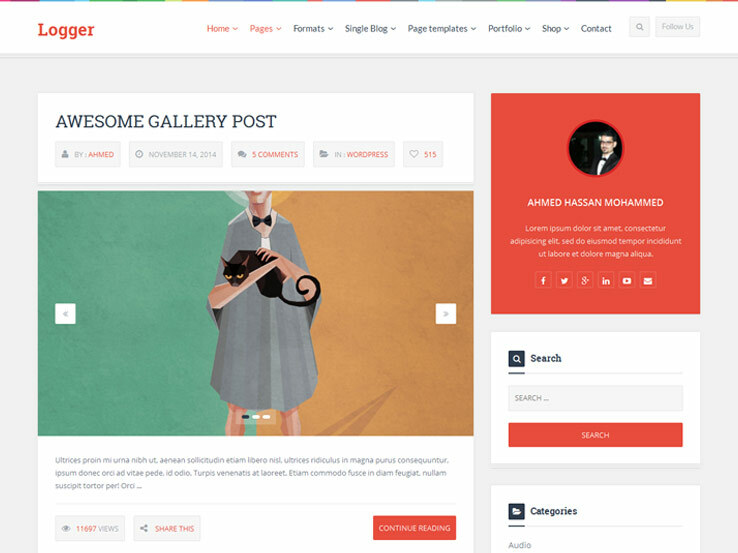 The theme is completely responsive with translation files, and it has post formats for items like audio, video, galleries, quotes, and more. As you can see, the media file support is rather strong with the Memoir theme. In addition, you get auto resizing footer widgets for the most optimal viewing experience. The slider galleries are automatically created as well, generating a stunning presentation of your best photos. The Memoir theme has social media buttons for getting the word out about your posts, and the Featured User widget shines a spotlight on some of the people you would consider VIPs. The LightBright theme looks similar to Tumblr. In fact, it’s probably the closest design you can get to Tumblr without making it look like a complete ripoff. This is another option created by Elegant themes, coming with a responsive layout, custom post types, and four color combinations to get started with. Four color combinations isn’t that many, but it at least gets the ball rolling in terms of branding your site for users. The whole point of the theme is to start sharing information about your life. You can upload videos and images, along with music tracks you might be recording. We enjoy the theme for personal bloggers or people who would just like to get their thoughts out on the internet. The theme even has special integration options for items like notes, links, quotes, and audio. As with most Elegant Themes products, the package includes a wide variety of shortcodes. 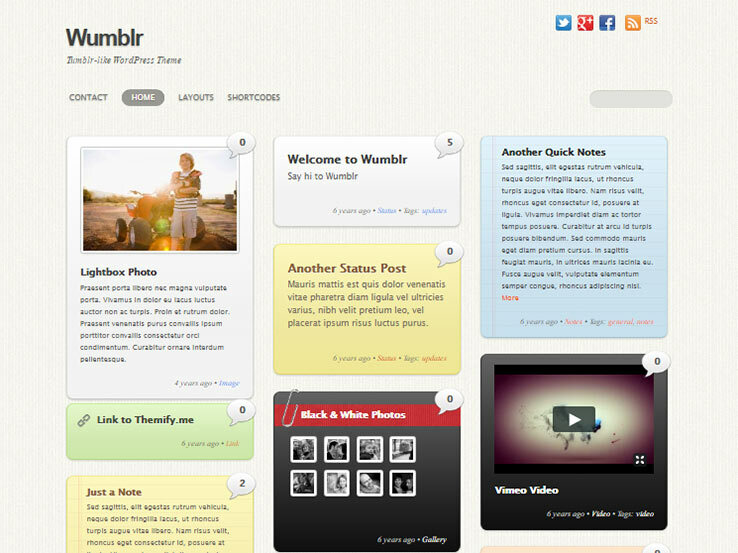 Wumblr looks kind of like Tumblr and kind of like Pinterest. All of your blog posts are shown on the homescreen like little post-it notes, using different colors and comment counts to entice your reader to click through. The fluid and responsive theme works on all devices, and it has nine post types. Some of these post types include video, quote, audio, notes, and links. Not to mention, you get to choose from over 15 color schemes, a step up from some of the other themes we’ve talked about already. We found the footer to be interesting as well. It supports up to four widget columns, meaning you can go out and find plugins for widgets that correspond with your blog. The seven different theme skins put a face to your brand, while the threaded comments work just like Tumblr, prompting users to make conversation about your posts. The multiple level dropdown menus guide people throughout your site, and the header widget actually supports social media buttons if you’re looking to spread your posts throughout the internet. 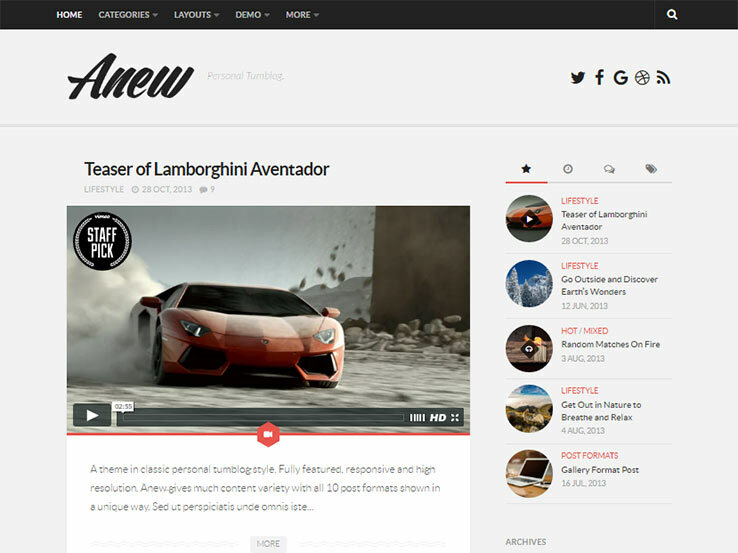 The Anew WordPress theme has a more modern take on the standard Tumblr layout. That said, it supports a wide range of media types such as videos and high resolution images. The ultra responsive layout includes all sorts of high resolution elements, making it ideal for those blogs with tons of quality photographs. The unlimited colors come in handy for branding, while the unlimited sidebars help out when you’re trying to organize your widgets. The theme provides hundreds of Google Fonts, and the flexible custom widgets pair nicely with the sidebars we talked about before. In fact, you can make it so that your sidebars slide and toggle into frame whenever a customer clicks on them. This is a wonderful way to clear out the clutter and ensure that all eyes are on your Tumblr-like content. Along with that, quite a few social sharing and following links are packaged in with the Anew theme. The Attache WordPress theme has a darker style to it, using a modern flow with its masonry style and beautiful structure. Keep in mind that the black background can be switched to a lighter shade. You can also change around colors for many of the other website elements. The responsive theme has infinite scroll, meaning that a user can scroll down on your blog and continue to see new articles without having to click on a new page. The custom menus aren’t as important with infinite scroll, but they do come in handy if you’re trying to sell something on another page. The main reason we like this as a Tumblr style blog is because of its media support. 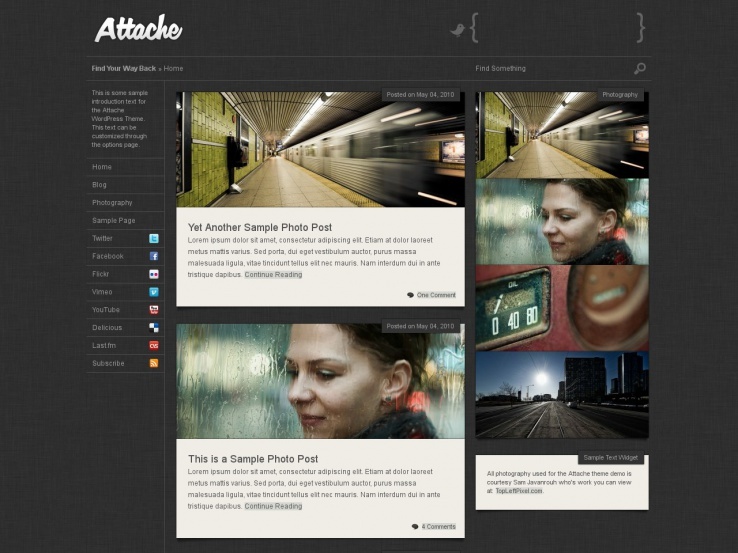 The Attache theme allows for embeds and uploads, coming from places like YouTube and Vimeo. We also think that the social media buttons are bound to make webmasters happy, since users can come to your articles and share them with friends. Along with sample content, Photoshop files, valid code, and SEO options, the Attache WordPress theme feature-set looks impressive. We love the Aside theme as a Tumblr style theme because it features a clean and simple design, has support for all media types, and provides room for interactions with support for comments and social sharing. The template makes it easy to share a variety of content; from images to audio and videos. Besides, the Aside theme is fully responsive and Retina-Ready for a smooth and seamless browsing experience on all devices and screen sizes. It also comes with several home layout styles, unlimited color schemes, background options, and hundred of fonts so you’ll have enough branding choices. 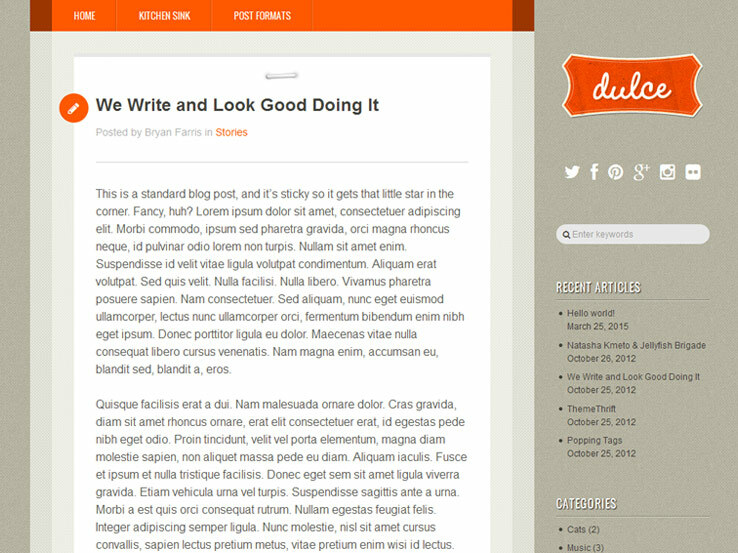 Dulce is a sleek Tumblr style theme designed for personal and professional bloggers. It supports all types of media including video uploads and embeds from platforms like YouTube. With 7 post formats, you can easily create audio, gallery, image, link, quote, status, and video posts. The front page displays your latest posts in a neat and simple layout resembling Tumblr. Moreover, the Dulce theme comes with social media integration, allowing you to easily connect with your fans and followers on different platforms. You’ll also find 4 color variations, nested comments for interaction with users, and custom widgets for adding things like your Twitter and Flickr feed. 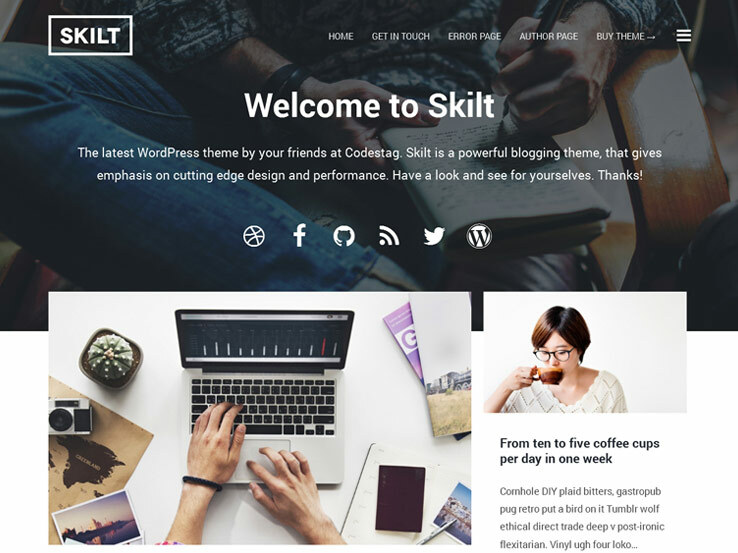 Skilt is an elegant Tumblr style theme with a simple masonry layout designed to present lots of content in a neat and stylish way. It supports all media types, making it easy for you to add images, video, and audio. In addition, social media icons feature prominently, which means your fans won’t have a problem following you and sharing your content on platforms like Facebook and Twitter. Integration with the WordPress theme customizer allows you to see live previews of the changes you make on your site, while the fully responsive and Retina-Ready design means your site will render seamlessly and look sharp even on high resolution displays. 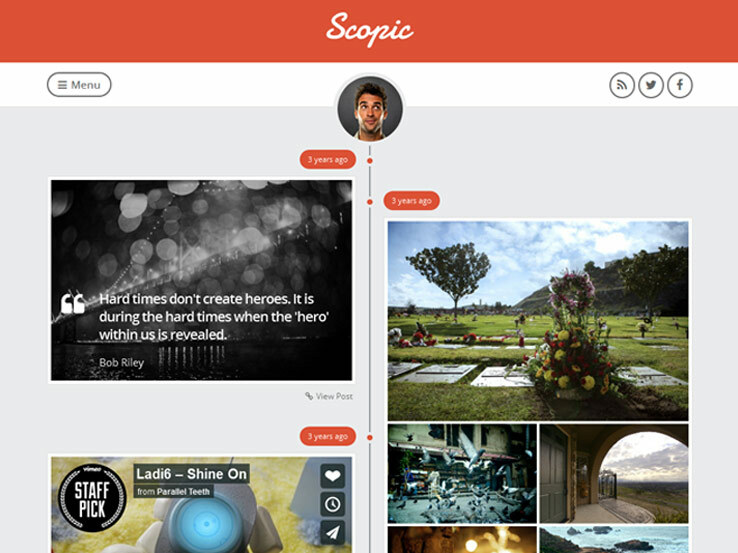 Scopic is another fashionable Tumblr style theme in this collection with a clean and modern masonry front layout that can accommodate a wide range of content. It supports rich media and makes it easy to embed content from different platforms such as Soundcloud, YouTube, Vimeo, Twitter, and Instagram. The in-built comment system allows readers to easily leave their feedback, while the sleek social media icons encourage people to follow and share your content. In addition, the Scopic theme is fully responsive and search engine friendly. It also includes custom widgets for displaying things like your Flickr feed and recent posts. Bulletin is a beautiful Tumblr style theme designed and built by the WPExplorer team. It comes with a grid style front page layout and has a left sidebar that features your logo at the top and navigation links just below. Besides, this template includes a catchy front page slider for highlighting your important content and a notification bar for displaying your offers and announcements. You can easily add a variety of content types to your site since the theme supports 5 post formats – standard, image, video, link, and gallery. Also, the Bulletin theme comes with a featured posts widget and supports threaded comments and highlighted post author comments. The Logger theme comes with several homepage styles including a Tumblr style blog layout that presents your latest posts with featured images, like buttons, view counters, and more. Social media icons feature prominently, making it easy for your fans to follow and share your content on Facebook, Twitter, and other platforms. 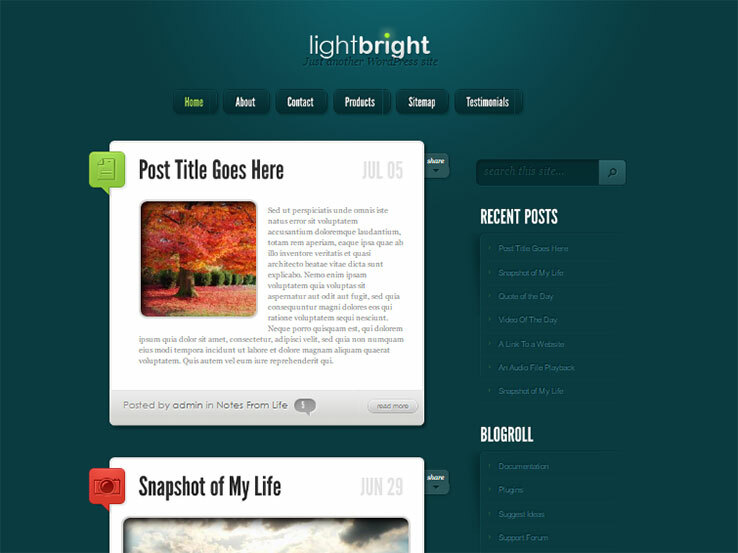 We like Logger for a Tumblr style theme because it also supports a wide variety of media content. You can easily upload or embed audio, photos, and videos from platforms like YouTube, Vimeo, Soundcloud, and more. Besides, the theme comes with a ton of custom widgets, which provide somewhat a drag-and-drop interface to easily add different elements to your site. The Vidley theme comes from the Press 75 company. It features a simple and clean front page layout and provides great video support. You can easily upload videos or embed from Vimeo, YouTube, and other platforms. Another great thing about this template is the advertisement integration options that make it easy to make money from your website. 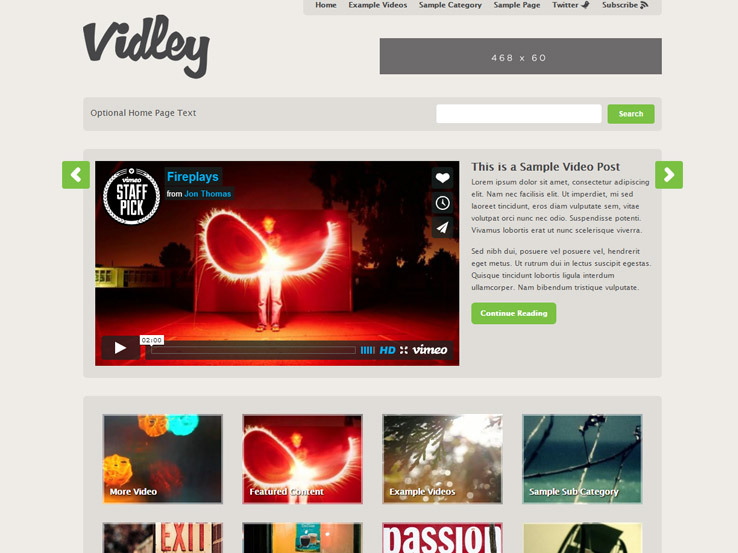 Furthermore, the Vidley theme includes customization options so you can easily style it according to your tastes. It also comes with custom widgets to easily drag and drop things like social media icons, ads, and recent posts to the sidebar or footer. 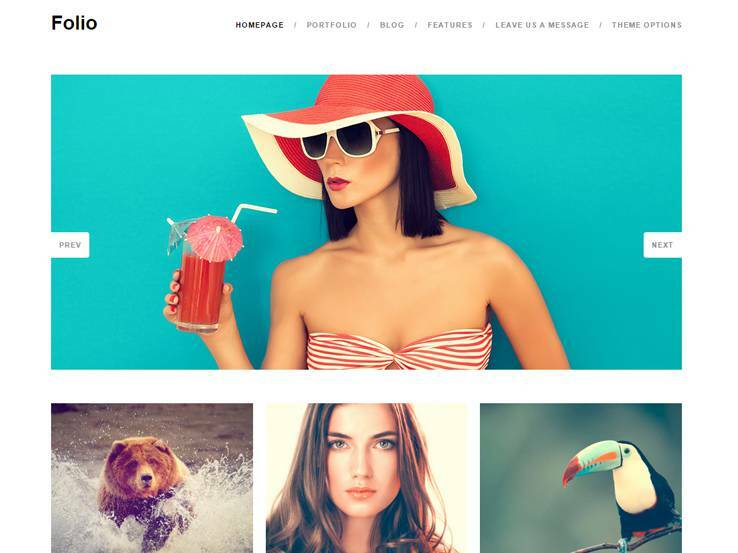 Meet Folio, a clean and simple WordPress theme for creative bloggers looking for an easy way to share image and video content. It stands out as a Tumblr style theme because of the powerful media support, which allows you to easily create posts with videos or image galleries. In addition, the Folio theme comes with color options for branding and support for infinite scrolling, which means visitors can view more of your posts without opening new pages. It also includes social icons and a theme customizer with live preview.